I am interested in genealogy and have a number of old documents such as wedding and death certificates, plus a number of old photos that are rather fragile. So what I do is scan them and I use my ScanNCut to do this. Now of course I could use a regular scanner but my scanner is limited to an A4 or US letter size. Plus I personally find the ScanNCut easier to use. I do use a ScanNCut Photo Scanning Mat for this. The reason I do, is that some of the documents are fragile so I don’t want them getting stuck on a sticky mat. This is what a Photo Scanning Mat looks like. You can see that it looks like a regular ScanNCut mat only it has a black trim instead of the usual blue or purple. One other important difference is that it has a plastic cover. With any of the other mats (ie. Standard Mat, Medium Tack Mat, Low Tack Mat), you remove the dust cover, but the cover on the Photo Scanning Mat is there to hold the documents in place and therefore does not get removed. You can also scan in things like woven badges and thin balsa wood shapes that tend not to stick so well to a regular mat. Some of these have interesting shapes that can be used on a scrapbook page, but you don’t want to damage the back by having it stick to your regular mat. I also just use it whenever I am scanning images printed on printer paper. 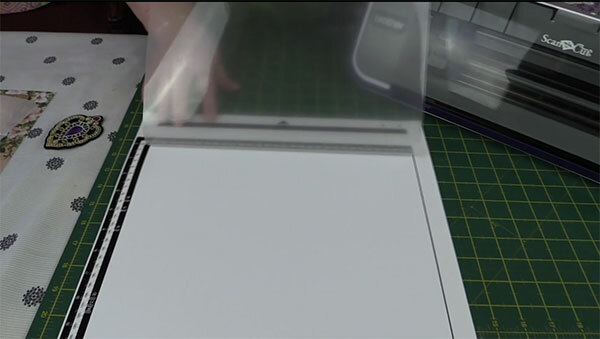 Printer paper can stick like glue to a regular mat plus it’s just much easier and quicker to place it in the photo scanning mat. 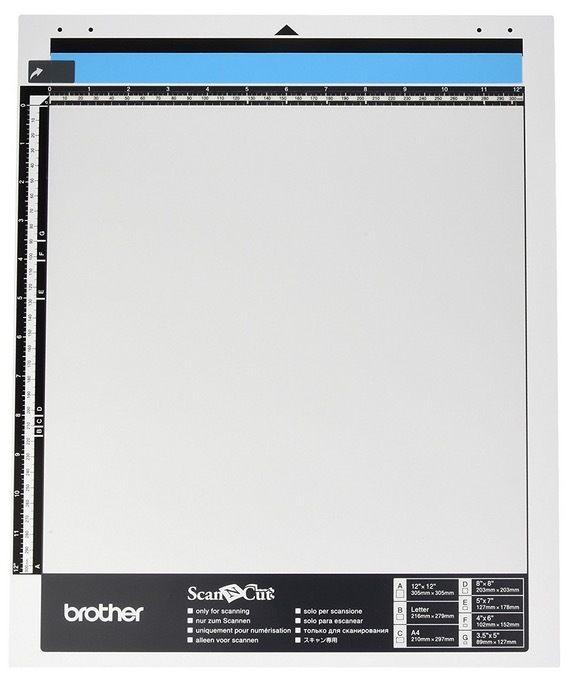 The ScanNCut Photo Scanning Mat is also ideal when you are scanning plastic stencils or anything with a clear, pale or opaque background. The machine will see these sorts of things a lot clearer if they are on a dark background. So you place a dark piece of cardstock in the photo scanning mat, then your stencil on top of that. Then place the plastic cover over the top and away you go. 1. It can scan through documents and photos and save them to a JPG format for you to store on your computer. Great for keeping digital records of those important fragile documents. 2. It can scan through images that you can convert to cutting files. So the Photo Scanning Mat is great for scanning fragile documents but it can also be used to just scan in shapes that are on a delicate background. Watch the video below to see how to use this mat. You’re welcome Jean, and thank you for the lovely comment. Thank you Pat for your great feedback. It’s made of thin plastic. Yes you can use the Standard Mat Sharon, however, be aware that it is sticky so don’t use it for delicate or fragile items that you cannot replace. The Scanning mat isn’t sticky and that why you can scan fragile documents with confidence. Hi Alanda, I want to buy one of these mats. Would the link on your site be for the Amazon Australia? I have never bought from them and was wondering as it is about half the price of buying from Spotlight. That’s a good price on Amazon Au, Veronica. Our link is to Amazon US. They don’t have an affiliate program for Australia as yet. When I try to scan my scrapbook page it comes out in an awful color on my thumb drive. Have you had this problem? I may need more clarification on this Vera. Are you scanning to save as a JPG image? We haven’t had that problem although to be honest we haven’t scanned a heap of images. Have you tried scanning other images to see if it makes a difference at all? I do have a question about the different types of scans. Do you have a video onthow you would use the third option? The third option “Scan to USB’ is in the video on this page. Just fast forward to about the 4 minute mark.